Whether you are planning a corporate day out, or shopping expedition to one of the north of England's great cities or a day out to London or Scotland then our Luxury V-Class is the vehicle tailored for the job. With spacious rear cabin and luxurious leather seats, the V-Class can transport up to 7 passengers in complete safely, comfort and style. The Conference seating in the rear of the V-Class allows up to six passengers to travel in comfort, with the extra-long wheelbase ensuring adequate legroom for long journeys. The ease of access makes the V-Class popular with Wedding Parties for Bride and Bridesmaids alike with plenty of room for those flowing dresses. Privacy glass also helps keep your travel private from the outside world. 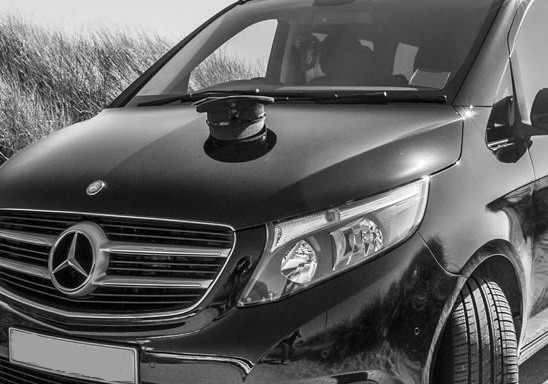 Our fleet of Black V-Class People Carriers are available with one of our trained Chauffeurs across Lancashire, Manchester, Liverpool and the Cumbrian Lake District on either half or full day hire. The V-Class Carries 7 clients in comfort with enough luggage space for 7 medium size cases and hand luggage or overnight cases.